I had a blast last weekend! It was the annual show for one of my rock clubs, the Contra Costa Mineral & Gem Society in Concord, CA Going to a show is a great time to shop, learn from displays and demonstrations, and talk with other rockhounds and lapidary artists. 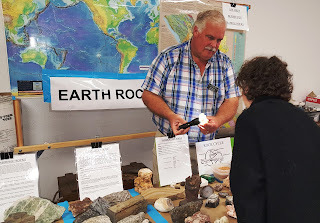 Another kids activity that was very popular and educational, gave kids the chance to learn about igneous, sedimentary, and metamorphic under the tutelage of an adult instructor. The best part was having the ability to handle examples of the different classifications. 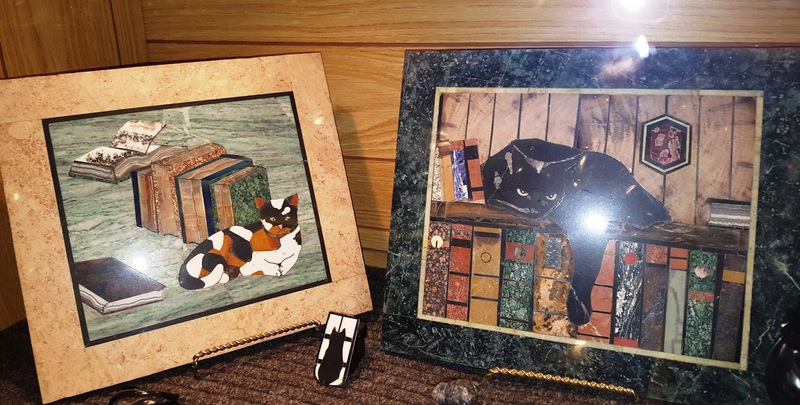 Our club has a long history of displays in cases where our guests see great stone art, jewelry, and educational elements created by our members and some guests. In addition to the forty-seven display cases in the main rooms, we had special displays like the model railroad with all the buildings and landscaping in its environment made of stone and a special room with three cases of fluorescent minerals. 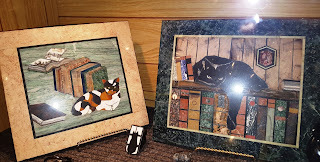 Here's one I love, The images are all mineral intarsia and very detailed. Sorry about the flash spots, our cases each have two spotlights coming through the top. This is one of my cases. 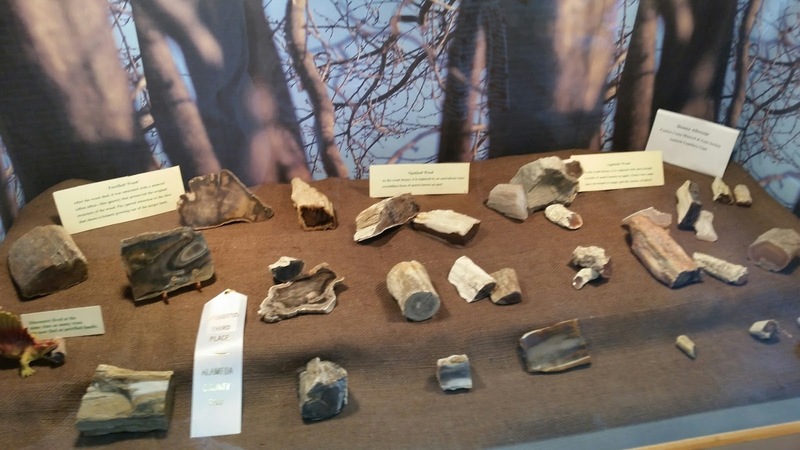 It's all about stem casts and shows three different styles, the basic petrified wood, opalized wood, and agatized wood. Because there isn't a lot of color, I took some pictures of a tree in front of my house when it was bare-branched, enlarged the heck out of it, printed it, and mounted it on cardboard cut to fit the three inside walls. 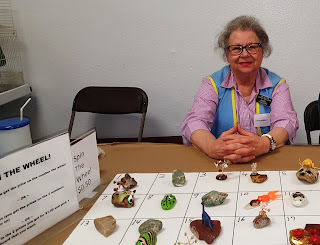 I LOVE shopping for rocks and slabs and I'd be happy if all our vendors specialized in rough and slabs, but in order to attract a wide variety of people (so we earn enough money to support the club programs and activities for the coming year) we have a range of vendors including fine jewelry (including pick your stone, pick your ring, bingo!) popular jewelry, specimens of all sorts, beads, small lapidary equipment and supplies, and even some novelty vendors like this one that painted messages on rocks of all sizes. 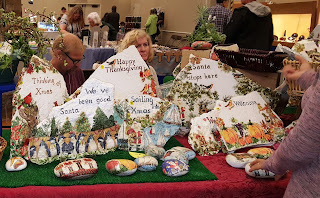 We had twenty-five vendors, who each took multiple tables creating a lot of shopping fun. 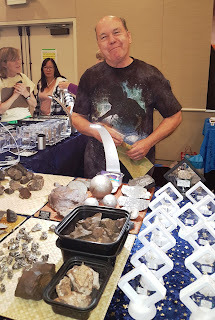 Lots of visitors were entranced by the meteorite vendor. 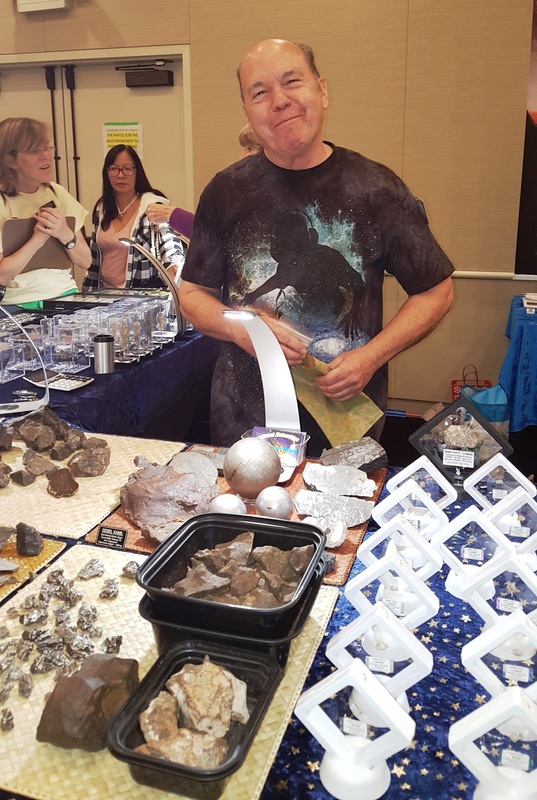 His display was, to say the least, "Out of this World". I think this vendor had every kind of 'findings' you could ever imagine! 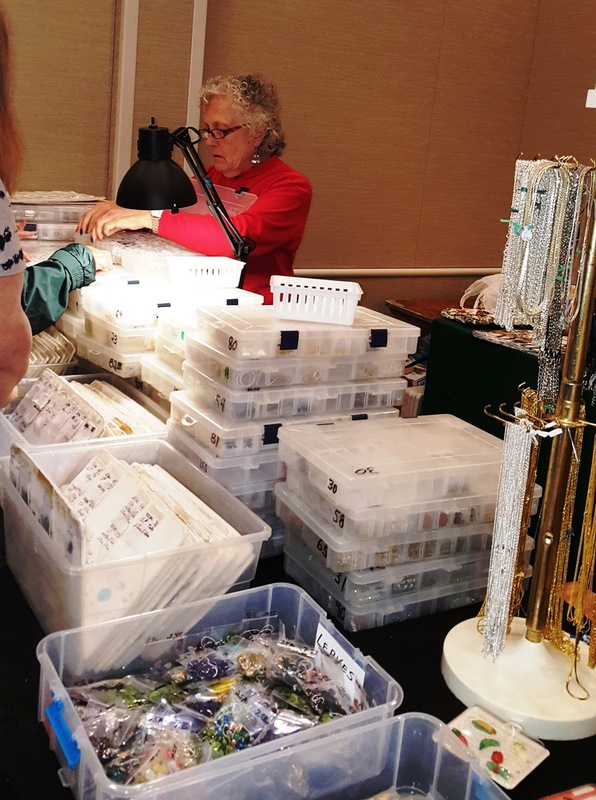 You not only can see and touch them to be sure they're what you want, you can purchase in small quantities--just the thing for the lapidary hobbyist! Fortunately for my budget, I was working so much that I had relatively little time to shop at the show. Our society has a big table with silent auctions throughout the event. The rocks that are auctioned off are donated by members. A lot of the material is rough rocks, usually with the name of the rock next to it. A lot of the kids are especially interested in having a big rock and they'll bid on some. Sometimes rock hounds recognize a rock that has real potential to become one or more cabochons, and they'll bid. As for me, I like the thrill of the hunt--as long as I don't have to bring a big rock down off a mountain. So when I saw this big beauty, (the yardstick shows it's nearly two feet long and it's nice and thick) sitting next to the auction table, I was intrigued. The label said agate. In the dark area of the upper left, there are what look like ends of square crystals. The coloring on the top appears to be weathering, with a few artistically placed blobs of bird poop. The bottom right now, is too dirty to see anything clearly. I'm hoping to get a chance on a big saw next week and check out the inside. More on this later! Hope you're enjoying the show season. It's just getting started and looks like it's going to be a great one.